We will be continuing to accept donations and fundraising through December. Thank you for your continue support for our precious children! The Childhood Brain Tumor Foundation is excited to hold our 2016 CBTF Superheroes 5K Walk/run and Kids’ Fun Run. Join us for this family friendly 5k walk/run and help make a difference! In past years, supporters have been phenomenal and always appreciated by team captains, families, and CBTF. This event is held in loving memory of children who fought bravely and superhero survivors that fight against brain tumors. An estimated 4,620 children are expected to be diagnosed with primary malignant and non-malignant brain tumors in the US this year. Although 69% of these children survive, they are typically left with serious, long-term side effects that vastly affect their quality of life. Sadly, some types of children's brain tumors, survival rates are still below 20%. 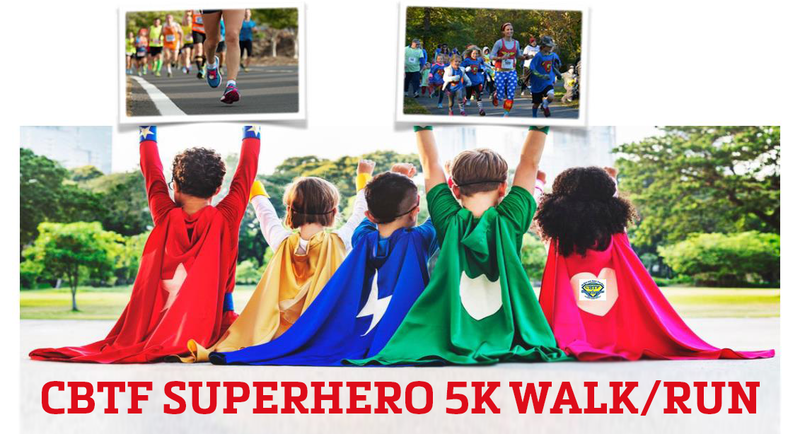 The 2016 CBTF Superhero 5k Walk/Run will be held on Sunday, October 9, 2016 at Meadowbrook Park/Candy Cane City, Chevy Chase. REGISTRATION FEES: Registration will be accepted on line until 8:00 pm on Thursday, October 6. In person registrations will be available during packet pick up on Saturday and at the race site Sunday morning starting at 7:30 am. 5k (timed): $35 - This person will be walking or running and will be chip timed. 5k (untimed): $30 - This person is walking and will not be chip timed. Kid's Fun Run: $15 -Kids will run before the 5k starts, it is untimed. All kids who participate will receive a shirt and medal. T-shirts will not be guaranteed for those who register after October 2. See course map here: This certified 5k course is flat, paved and suitable for boht serious runners and casual walkers. The park does allow strollers and leashed dogs. POST RACE: There will be great post race refreshments including; bagels, muffins, fruit, water and other beverages. AWARDS: Top 3 overall male & female finishers will receive cash prizes ($100, $50, $25). The top 3 runners in each age category will also receive awards. Age divisions; 14 & Under, 15-19, 20-29, 30-39, 40-49, 50-59 and 60 & Over. GO THE EXTRA MILE! - Set up your own fundraising page, set your goal and collect donations from friends and families. Upon completion of your race registraiton you will be prompted to "Go the extra mile" and set up your very own fundraising page. Your support goes to enhance our mission to find cures, include a photo, share on Facebook/Twitter and email your friends! All donations are appreciated! Join the fun, Grab your friends and set up a Team! 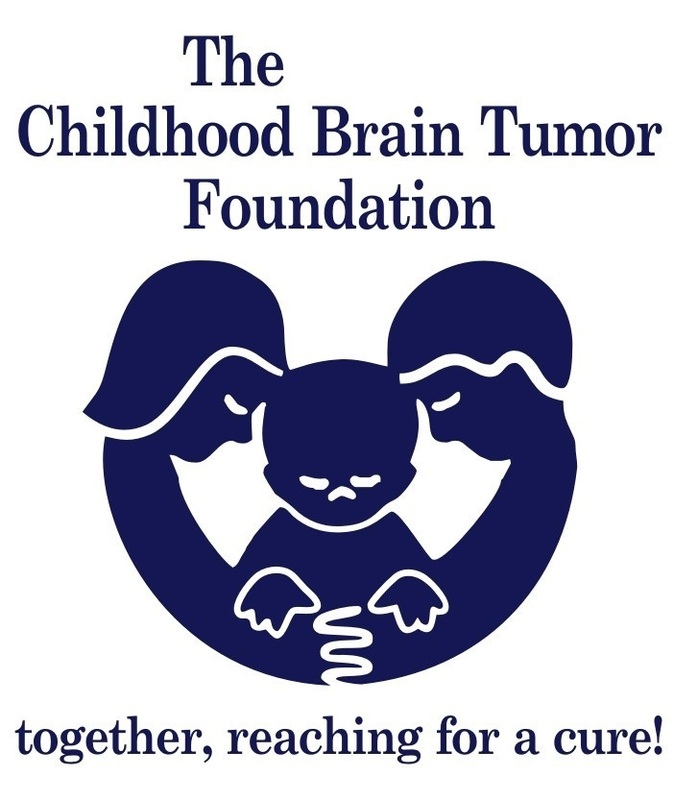 The Childhood Brain Tumor Foundation was founded in 1994 as a nonprofit. The mission of CBTF is to support cutting-edge research for childhood brain tumors, find cures and create awareness. We are dedicated to heightening public awareness of this devastating disease and improving the quality of life for those that it affects by funding vital research initiatives. The Foundation provides educational information to families of children who have been diagnosed with a brain tumor. Since inception, the Foundation has funded over $3.28M for research and has supported medical conferences and educational/support day events. Your support will help make a difference for the kids!! SPONSORSHIP: There are many sponsorship opportunities available, View all opportunities here and then contact: cbtfmd@aol.com for more information. Security of Information: Encryption techiniques are used to ensure credit card information, personal data and passwords are secure over the Internet and on our database server. I wish to participate in the Childhood Brain Tumor Foundation (CBTF) Superheroes 5K Walk/Run and Kids' Fun Run on Sunday, October 9, 2016. I understand the acceptance of the waiver is required to participate in the Event. I further understand that I am solely responsible for my health and safety, and I acknowledge that I am physically capable of participating in and completing this Event. I agree to abide by any decision of an event official relative to my ability to complete this event safely and I further agree that event officials or volunteers may authorize necessary emergency treatment for me. If I am injured as a participant in the Event, I agree to assume all risks and to release and hold harmless the Childhood Brain Tumor Foundation, and its officers and representatives. Further, I grant permission to all of the foregoing to use any photographs or video clips for the CBTF newsletter or website. I understand that there are no refunds should severe weather cancel the event. I further understand that this event may change date or location if required by local authorities. I have carefully read this Waiver and Release and fully understand its contents. I am aware that this is a RELEASE OF LIABILITY and a contract between me and the persons and entities mentioned above and that I accept of my own free will. If the participant is under 18 years of age at the time of registration, the participant’s parent or legal guardian must completely review this Waiver and Release. The parent or legal guardian understands and consents to its terms, and authorizes the participation of the registrant by his/her acceptance below.